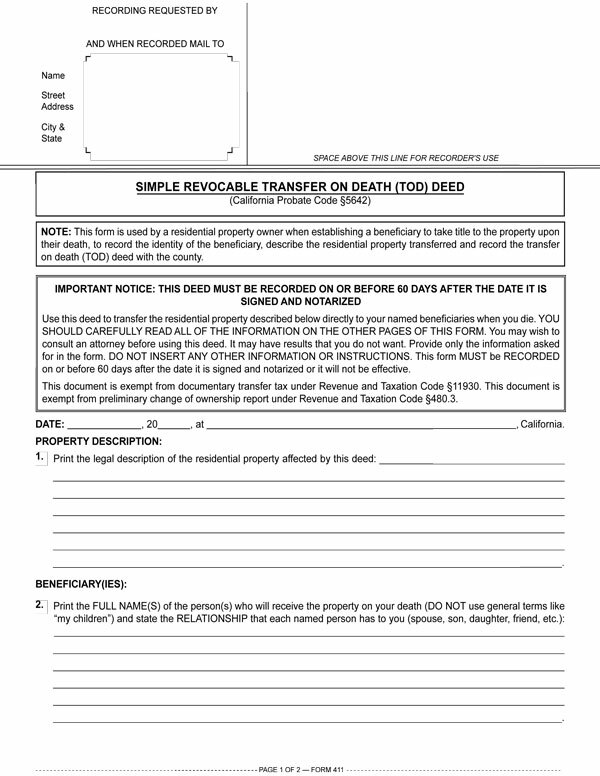 This form is used by a residential property owner when establishing a beneficiary to take title to the property upon their death, to record the identity of the beneficiary, describe the residential property transferred and record the transfer on death (TOD) deed with the county. agricultural land of no more than 40 acres which includes a single-family residence (SFR). record the RTDD within 60 days of its signing before a notary. If more than one deed creating a revocable transfer is recorded for the same real estate, only the most recent deed is effective. If another type of deed recorded before the owner’s death creates an irrevocable transfer of real estate, the RTDD is ineffective. An owner’s rights are not affected by an RTDD prior to the transfer. The RTDD does not convey real estate, create property rights for the beneficiary or prohibit action by the transferor’s creditors to collect on any encumbrances on the real estate until after the owner dies and the real estate is transferred. Upon the owner’s death, the RTDD transfers real estate to the beneficiary under the terms established in the deed. Multiple beneficiaries receive real estate transferred by an RTDD as tenants in common. If any one of the multiple beneficiaries cannot receive their share of the property, their share is transferred to the other beneficiaries in equal shares. the real estate is held in joint tenancy or as community property with a right to survivorship. Liens against the real estate existing prior to the transfer have priority over any debts or obligations accumulated by the beneficiary. The transferred real estate is subject to any encumbrances existing at the time of the owner’s death. Revocation of an RTDD does not reinstate any prior deed rendered inactive by the RTDD. RTDDs are only effective if recorded before January 1, 2021.